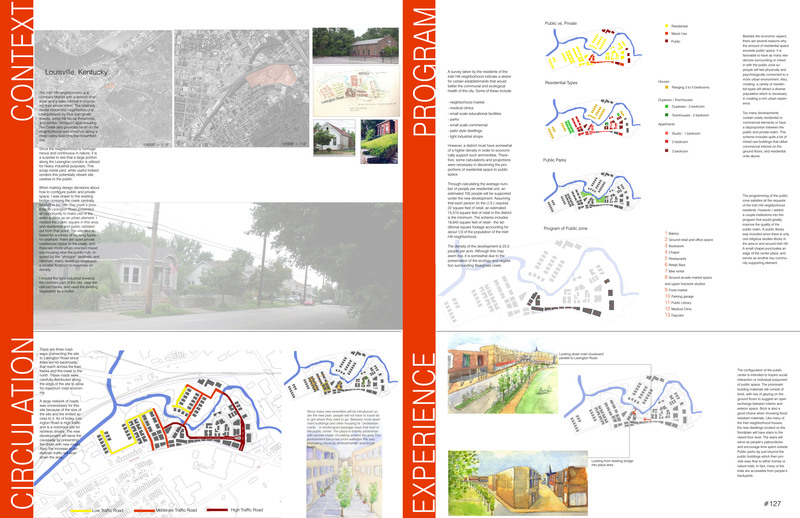 The Irish Hill Neighborhood Association is pleased to announce the display of the Mediative Urbanisms competition boards at the Urban Design Studio. 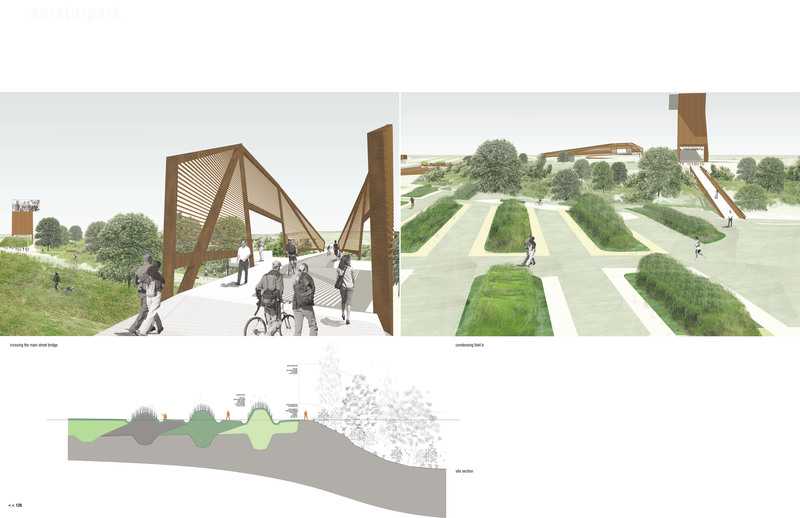 First prize, as selected by a five member jury, was a concept submitted by a team from Paris, France titled “A Scenic Walkway.” All 20 entries can actually be seen at the Urban Design Studio for an undetermined amount of time or on the IHNA website, www.irishhillneighbors.org. 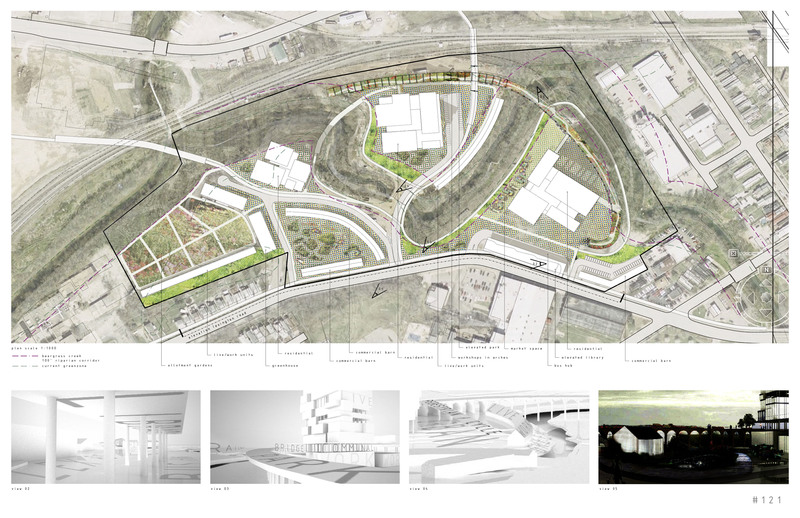 Mediative Urbanisms, an international open ideas competition, was created to encourage critical thinking for a 30-acre post-industrial site located on Lexington Road, Louisville, KY…and it was SUCCESSFUL! IHNA now invites the public to witness the excitement of the possibilities for the site through the eyes of urban designers, architects, landscape designers, artists and creative citizens. Frequently playing hosts to planning and design charettes and discussion forums that help increase the level of public involvement, the Urban Design Studio (UDS) is the perfect venue to house the display. The gallery space is open to the public Monday – Friday from 10AM – 4PM or by appointment with an IHNA representative. UDS is located at 507 S. 3rd Street. For more information about the Urban Design Studio, contact http://udstudio.org. or call 502.587.7015. 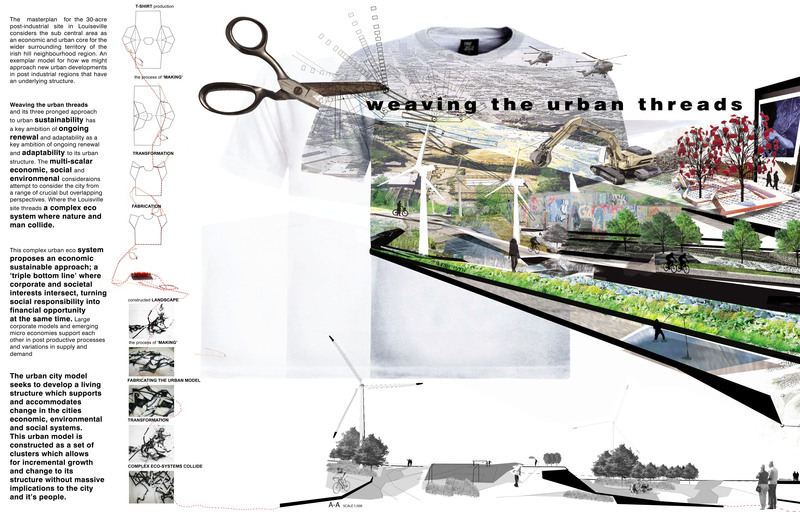 If you would like more information on the Mediative Urbanisms competition or to schedule an appointment with an IHNA representative, contact Chandler Bainter at irishhill@techemail or call, 905.4342. This project contends that the full restoration of Beargrass Creek is dependent upon the degree to which it is embraced as a vital piece of urban infrastructure, like the roads, expressways, and rail lines that often flank its edges. The creek’s potential value is not merely aesthetic or recreational (though these are important), but ecological and, indeed, urbanistic. As such, its restoration should be an opportunity to cultivate compatible programs in an approach that is both locally- and regionally-minded. Here in Irish Hill, we envision Beargrass Creek and its watershed as a site for forging “ecological alliances” among various natural systems, most notably, vertical agriculture. The Irish Hill site, situated on the edge of downtown and near the confluence of the South and Middle Fork, offers an opportunity to cultivate these productive landscapes as a new form of community infrastructure. The site’s value is thus calculated not by the standard metrics of real estate, but by aspects of its “terroir”: the unique topographical, climatological, and environmental qualities that render it suitable for urban agriculture. The repositioning of Kentucky’s tobacco-dependent farm economy has created an acute need for new markets for local agricultural products. 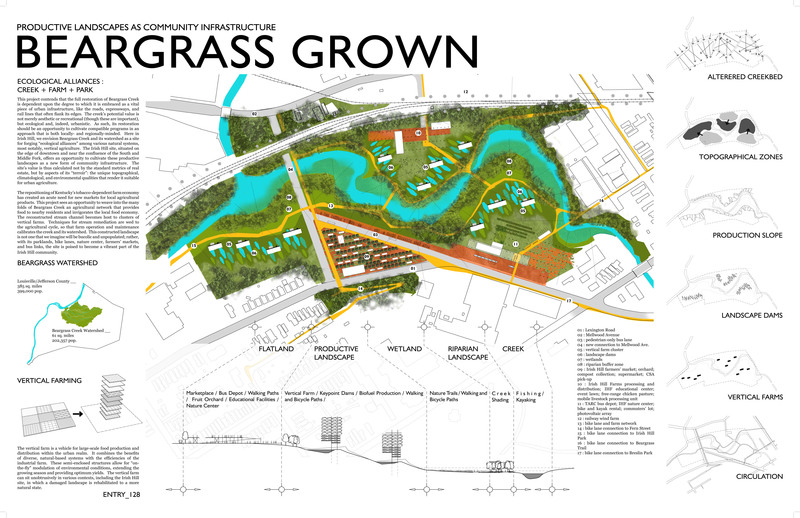 This project sees an opportunity to weave into the many folds of Beargrass Creek an agricultural network that provides food to nearby residents and invigorates the local food economy. The reconstructed stream channel becomes host to clusters of vertical farms. Techniques for stream remediation are wed to the agricultural cycle, so that farm operation and maintenance calibrates the creek and its watershed. This constructed landscape is not one that we imagine will be bucolic and unpopulated; rather, with its parklands, bike lanes, nature center, farmers’ markets, and bus links, the site is poised to become a vibrant part of the Irish Hill community. 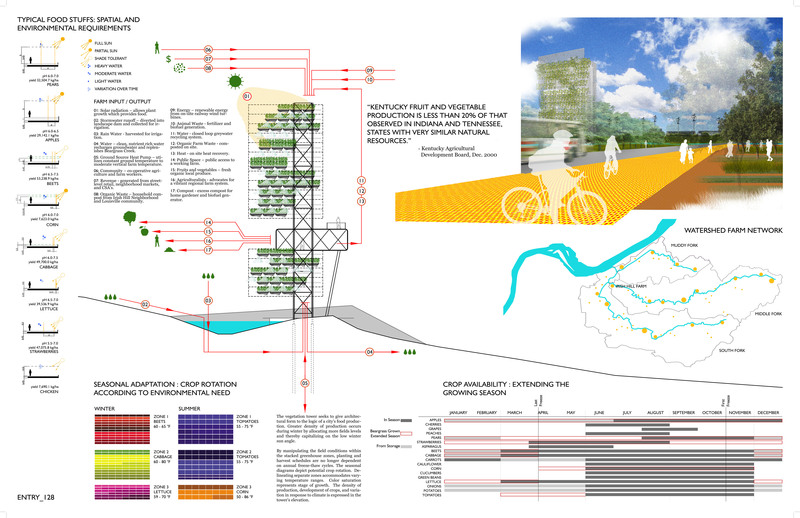 The aeratorpark is a new urban park and transit center for the city of Louisville, KY that integrates the productive potentials of transportation networks, alternative land use strategies and embedded remediation technologies to create a highly adaptable cultural center and highly functional pollutant filtering landscape. Previously inhabited by distilleries and metal scrap yards, the site holds extraordinary potential as a cultural and metropolitan destination, but requires extensive clean up. Responding to the primary concern of contamination, the aeratorpark is strategized around the transformative and economical organization of remediation berms. Contaminated soil is efficiently graded into three areas of treatment, creating fields of phytoremediation furrows and filtering swales. All of the existing on-site materials, waste and structures are recycled and reorganized to detain, treat, and filter any previous or future pollutants. Additionally the berming produces a unique topography for numerous programmatic conditions as an urban park and transit hub. Building on the unique location and existing topography of the site, the aerator park employs the intelligent control of hydrology to facilitate the development two principle ecological zones. The condensing fields represent the open and previously programmed areas of the site. The berms filter water to treat existing soil conditions and aid in the passive control of hydrology. The creek bed, defined by steep embankments and western flood plain, is reapproprated as an urban forest, further filtering the sites watershed, and providing a viable carbon sink. 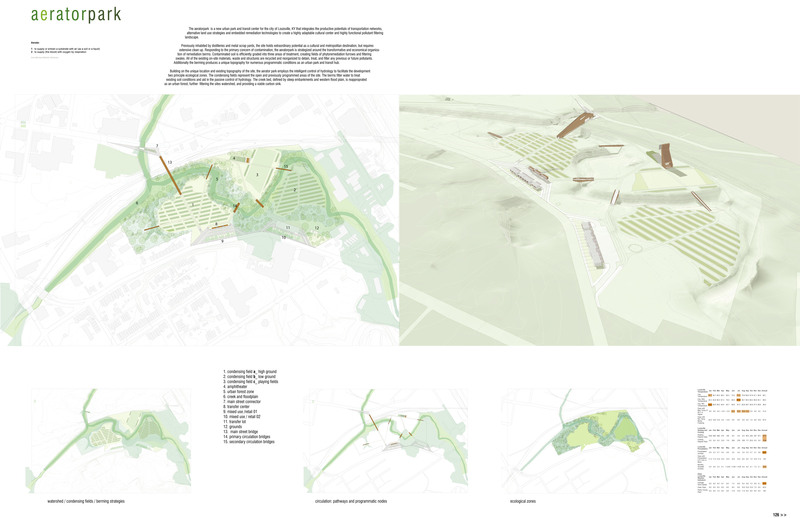 On an abandoned brown field site, cut in 3 by a wild beautiful creek, a urban network with key elements BARN, ARCH and HIGH RISE, is proposed to achieve 3 fundamental goals. 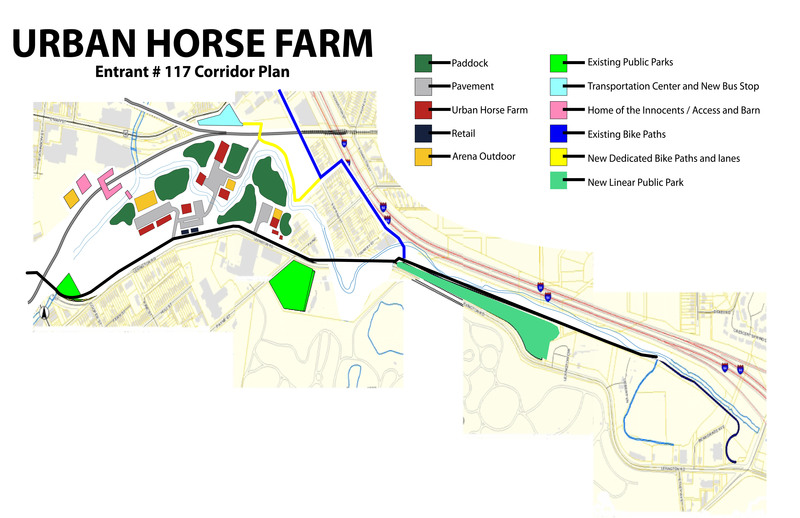 BARN – Firstly, Beargrass Creek needs to become a place, it needs an identity. Through the provision of a 100’ riparian corridor, the network allows Beargrass Creek to discover itself and mature. White as snow falling from the gray sky, glowing like building lanternas, urban barns and mineral pedestrian paths constitute a borderline between superimposed urban and current wild.A clear but transparent boundary between green and urban creates interest by making places of great diversity. Diversity is essential to bring life to the area without a complete transformation. Additional barns create a commercial facade facing lexington road and an elevated library with bus hub underneath opposite headliners music hall. 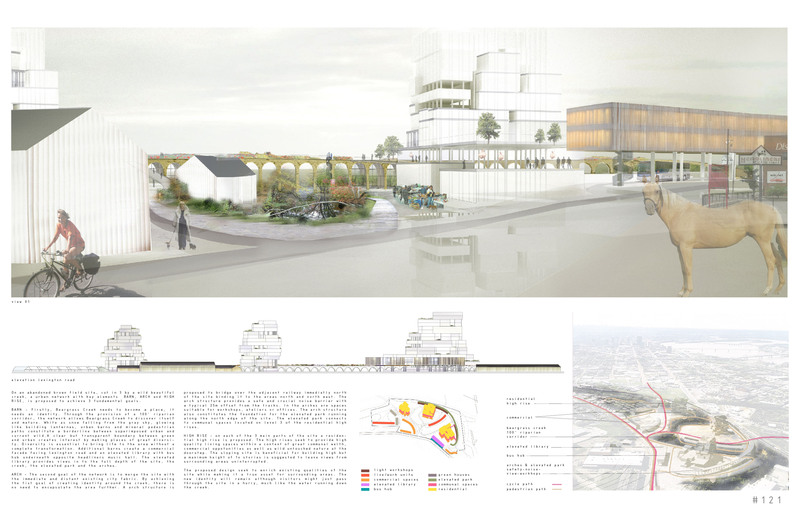 The elevated library provides views in to the full depth of the site, the creek, the elevated park and the arches. 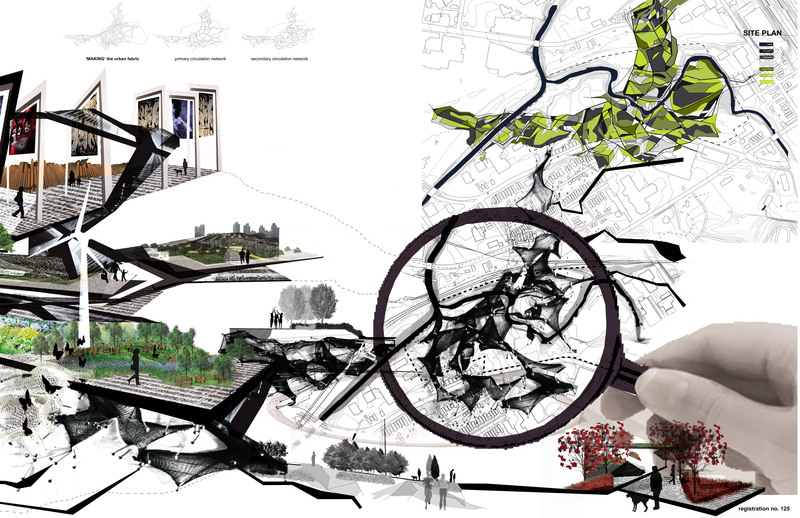 ARCH – The second goal of the network is to merge the site with the immediate and distant exist­ing city fabric. By achieving the fist goal of creating identity around the creek, there is no need to encapsulate the area further. A arch structure is proposed to bridge over the adjacent railway im­mediatly north of the site binding it to the areas north and north east. The arch structure provides a safe and crucial noise barrier with a typical 25m offset from the tracks. In the arches are spaces suitable for workshops, ateliers or offices. The arch structure also constitutes the foundation for the elevated park running along the north edge of the site. The elevated park connects to com­munal spaces located on level 3 of the residential high rises. HIGH RISE – on each of the 3 main parts of the site a residential high rise is proposed. The high rises seek to provide high quality living spaces within a context of great communal welth, commercial oppotunities as well as wild untouched nature at the doorstep. The sloping site is beneficial for building high but a maximum height of 1o stories is suggested to leave views from surrounding areas uninterrupted. The proposed design seek to enrich existing qualities of the site while making it a true asset for surrounding areas. The new identity will remain although visitors might just pass through the site in a hurry, much like the water running down the creek. 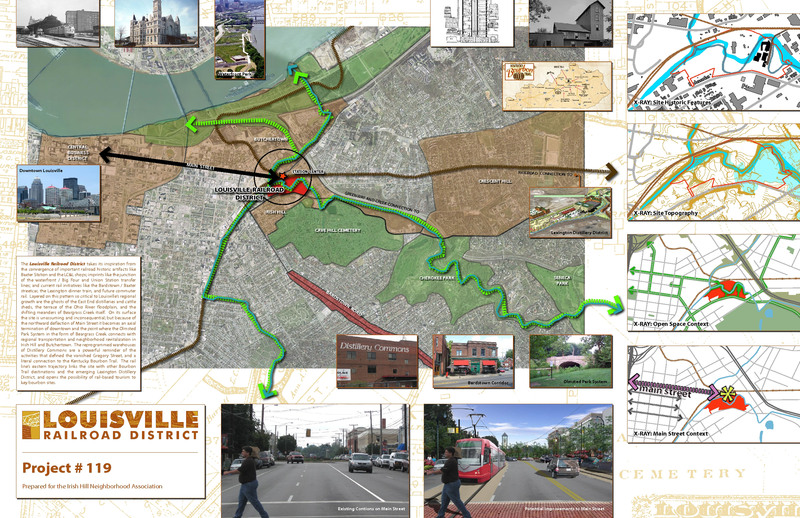 The Louisville Railroad District takes its inspiration from the convergence of historic railroad artifacts like Baxter Station and the LC&L shops; imprints like the junction of the waterfront / Big Four and Union Station transfer lines; and current rail initiatives like the Bardstown / Baxter streetcar, the Lexington dinner train, and future commuter rail. 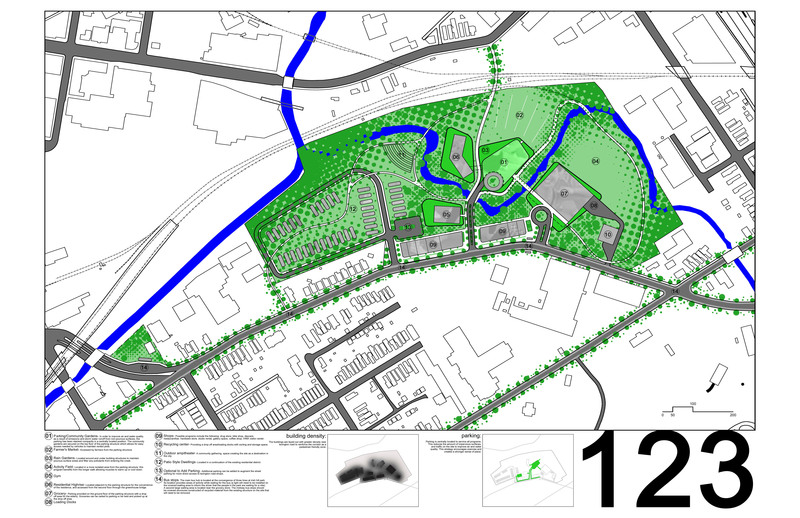 On its surface the site is unassuming and inconsequential; but because of the northward deflection of Main Street it becomes an axial termination of downtown and the point where the Olmsted Park System, in the form of Beargrass Creek, connects with regional transportation and neighborhood revitalization in Irish Hill and Butchertown. 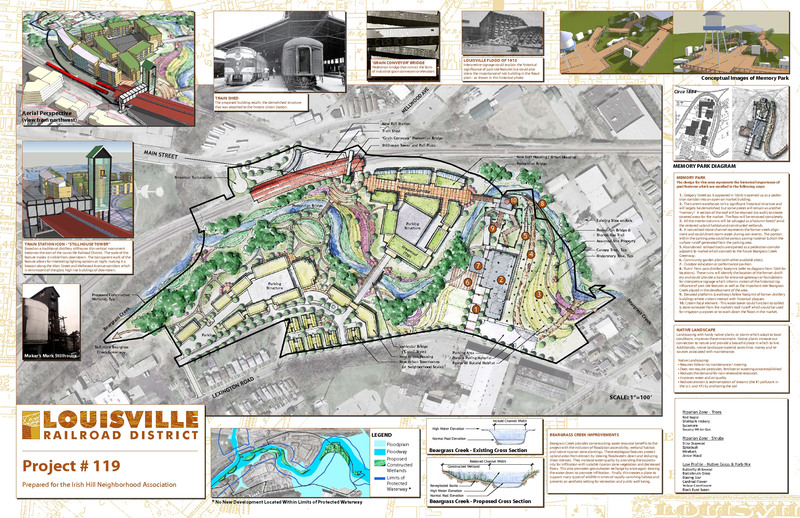 This urban narrative dictates many of the on-site and off-site moves, especially by restoring a large amount of usable open space in the form of passive parks and interactive wetland environments along Beargrass Creek; the rail station at the Main Street terminus with its recreation of the Union Station train shed; the open-air market perched above the floodplain on platforms tracing the whisky warehouses lost in a flood; and the housing clustered on the peninsulas formed by the creek meanders. 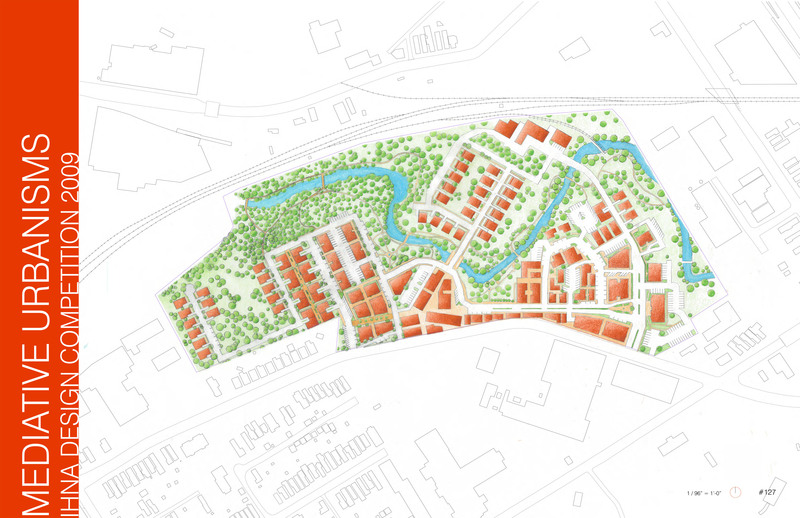 Beargrass Creek and the railroad – physical barriers that separate Irish Hill and Butchertown – have become the primary urban design drivers of the proposal and are celebrated as the centerpiece of a mixed-use industrial district that connects the two neighborhoods. In the meshing of the neighborhoods suggested by the bends of the creek, or the rails stretching to Cincinnati, Lexington and beyond, much of Louisville’s essence is revealed in this one unique spot – and its neighborhood renewal and vibrancy is merged with its regional future. 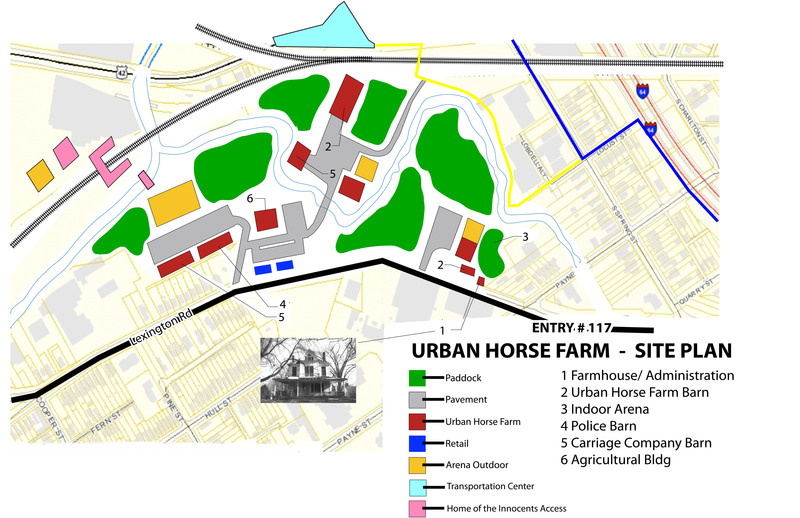 Louisville’s innovative Irish Hill is uniquely situated for Kentucky’s first urban hippotherapy treatment center and farm. Collaboration with sixty impacted health agencies, city, state, & federal governments, local & regional education centers and companies creates four hands-on programs with symbiotic funding and operational solutions. Hippotherapy involves occupational/physical therapy for children and adults utilizing equine movement to achieve physical, mental and developmental health of those with mobility, speech, visual and hearing impairments, emotional disturbances, learning disorders and at-risk populations. Vocational groom education for high school students to care for the horses. Two-year barn management college students see to the running of the stables. Occupational/Physical Therapy Interns conduct the hippotherapy. The combined resources of its stakeholders returns this brownfield to ecological jewel by traditional cap and plant technology remediation. Sustainable improvements to the Lexington corridor linear public park include removal of non-native plants, adding a limestone wall and view-scape addressing safety concerns. The limestone wall continues after Payne Street. An Administration building hearkens the Liebert Farmhouse. Neighbors, Louisvillians and tourists, whether by commuter rail to the north, the #19 bus to the south, by foot, bike or on horseback, or relaxing in the City Club atop the Transportation Center, enjoy views of limestone walls and four-panel-fenced pastures of paddocks for horses or crops, wetlands, riding arenas and barns. Area residents receive a discount to encourage their own health and home improvements at the green grocer inside the retail building that also houses a cafe and tack shop. This Kentucky signature industry showcase realizes hippotherapy with the revenue-generating potential to contribute to its own upkeep; equine-based training providing job-relevant skills in and outside the horse industry; and on a very personal level, aspirations realized far beyond the confines of a disability – all here in the heart, and hearts, of Louisville’s Irish Hill.